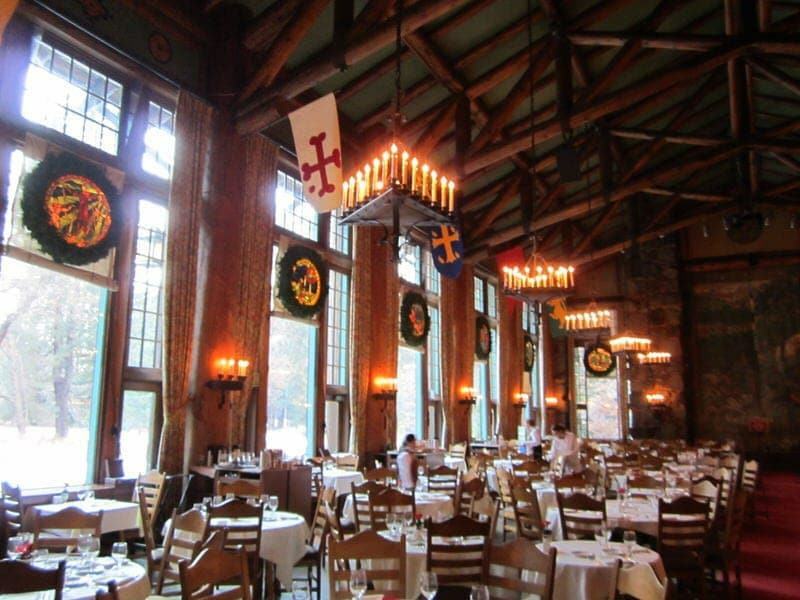 The Bracebridge Dinner at The Majestic Yosemite Hotel (formerly The Ahwahnee) is a long-held Christmas tradition at Yosemite National Park. 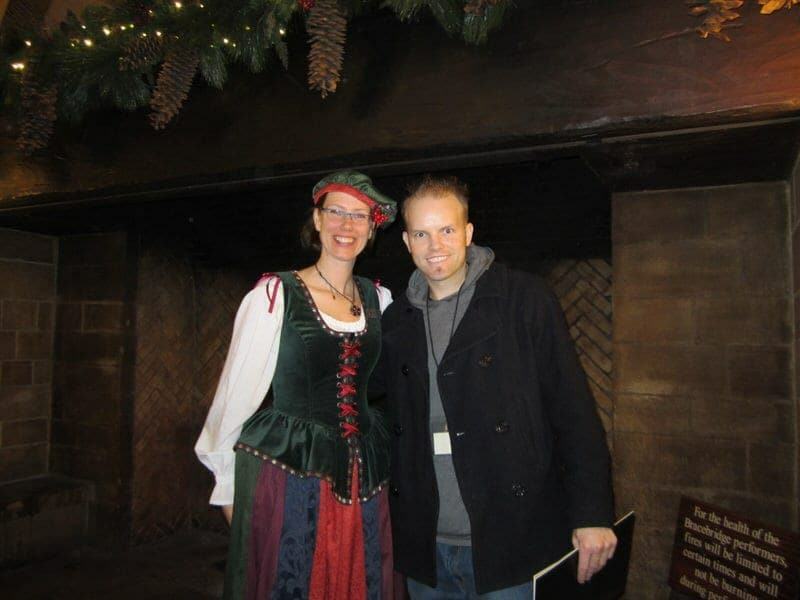 Each December, The Majestic Yosemite Hotel dining hall is transformed into a 17th century English manor where guests are invited to join Squire Bracebridge for a Christmas celebration. 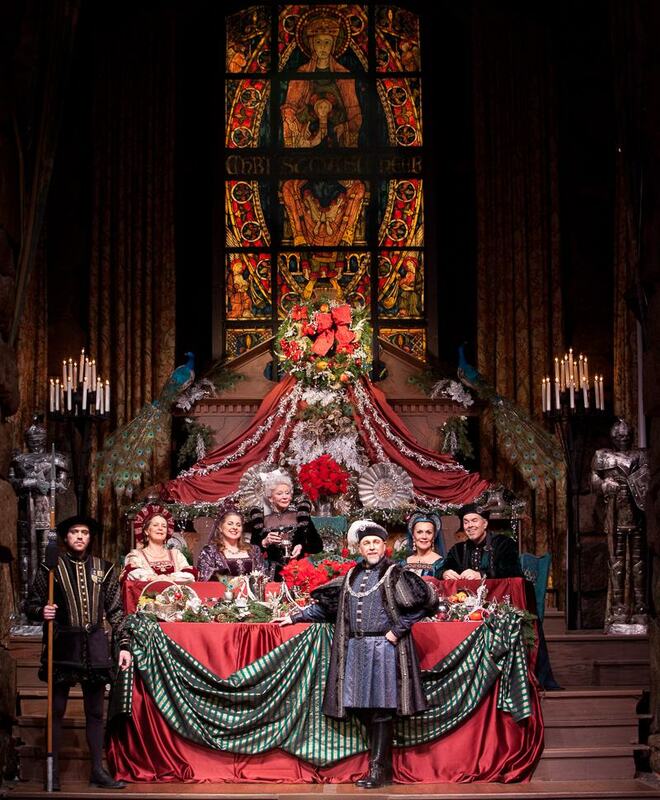 This 4-hour Yuletide celebration is a dazzling whirl of singing, acting, and pageantry which revolves around a 7-course feast. 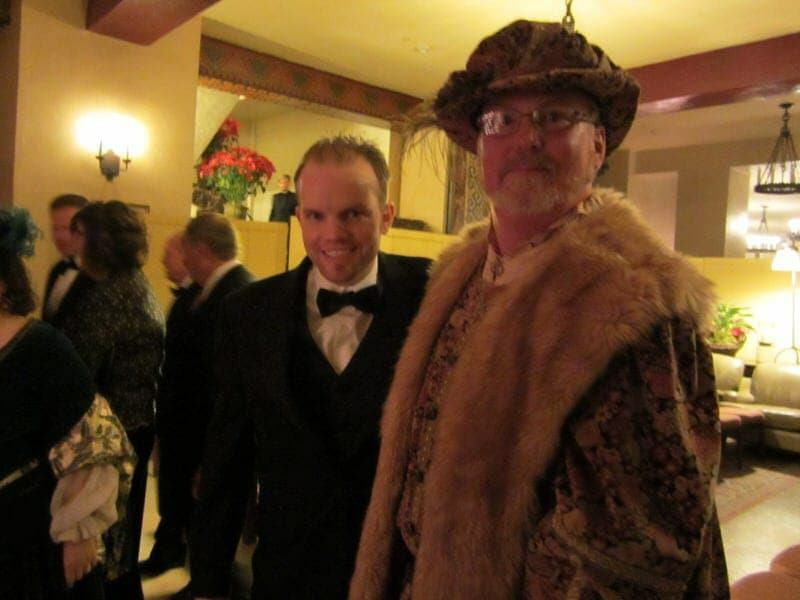 Obviously, I had been wanting to attend this venerable dinner pageant since I first heard about it several years ago. This year for Christmas instead of exchanging gifts, Ethan and I spent three days and nights in Yosemite and attended the Bracebridge Dinner at The Majestic Yosemite Hotel. 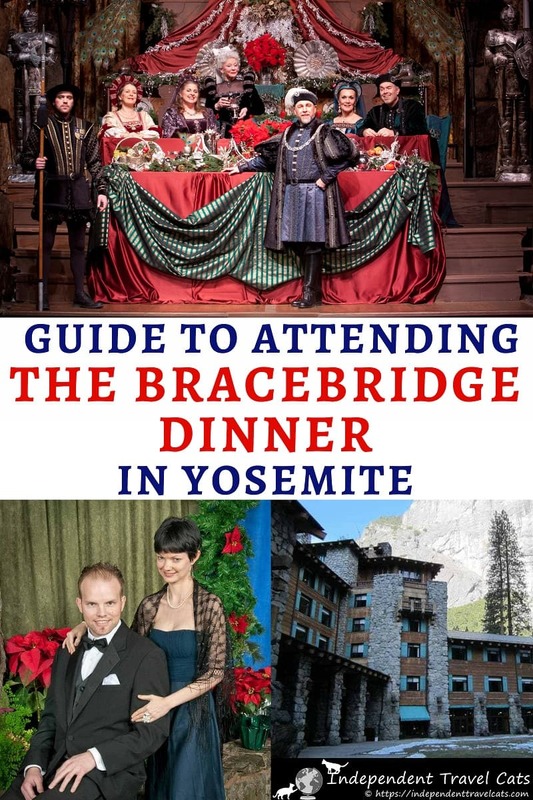 If you are interested in attending or just want to find out more about this event, read on and we’ll tell you how to attend and share our experience of attending the Ye Olde Bracebridge Dinner at Yosemite. Before we share our specific experience attending the Bracebridge Dinner, we wanted to share some of the history of this Christmas event, information on booking it, and some of our tips for making the most of the Bracebridge Dinner and your time in Yosemite in December. What is the Bracebridge Dinner? The Bracebridge Dinner is a Yosemite tradition that began in 1927 as a Yuletide pageant to draw visitors to the park during the winter. Today’s celebrations still retain many of the elements of the original pageants from the 1920’s and 1930’s and include over 60 costumed professional singers and actors who sing and perform while a 7-course banquet dinner is served by The Majestic Yosemite Hotel’s culinary staff. 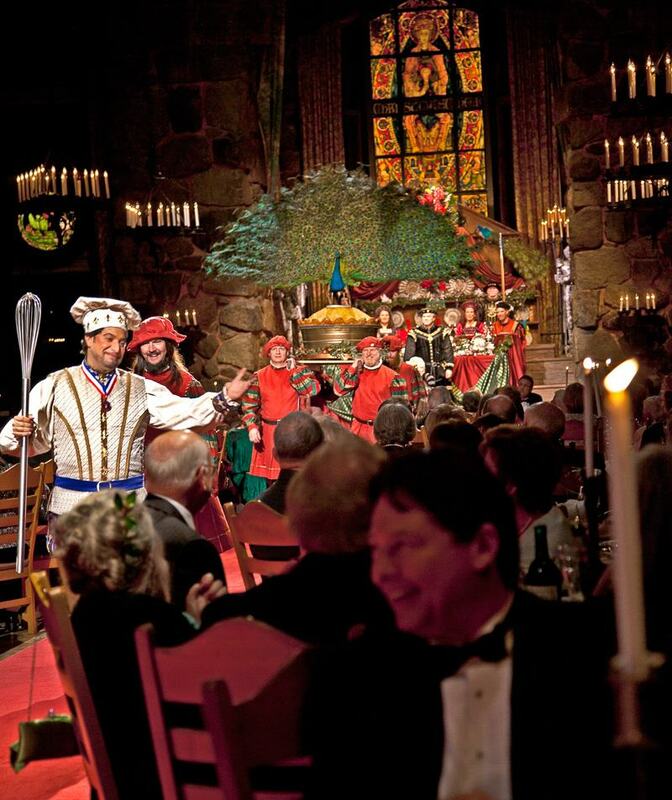 The Majestic Yosemite Hotel’s great dining hall is decked out in elegant Christmas finery and sets a stage for this four-hour warm-hearted Christmas celebration filled with Christmas carols, Renaissance rituals, irreverent humor, and medieval entertainment. Origins of the Bracebridge Dinner? The original pageant script was written by Garnet Holme in 1927; however, the dinner celebration is based loosely on a series of stories from Washington Irving’s The Sketch Book of Geoffrey Crayon, Gent. (1819-20). The Sketch Book is world famous for other tales such as “Rip Van Winkle” and “The Legend of Sleepy Hollow”, but the dinner would be based loosely on a series of five Christmas stories where Irving portrays idealized and nostalgic old English Christmas festivities occurring at an English manor owned by a Squire Bracebridge. These sketches were based on Irving’s own experiences enjoying Christmas at Aston Hall in Birmingham, England. Irving’s portrayal of these old-fashioned Christmas customs and rituals is credited with both influencing the revival of the Christmas holiday celebrations in the United States (yes, Christmas celebrations were out of favor at the time!) and the writing of Charles Dickens’ A Christmas Carol. Where is the Bracebridge Dinner? When is the Bracebridge Dinner? 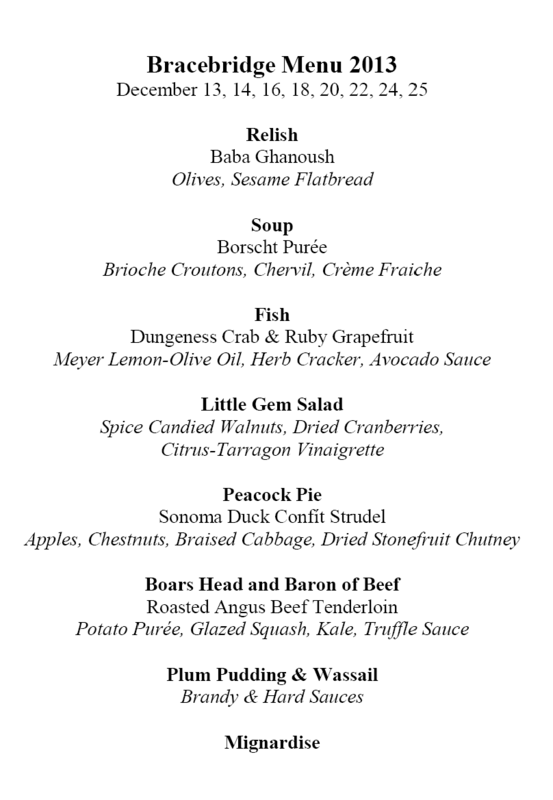 While traditionally done on Christmas Eve or Christmas Day, the dinner is now offered on several dates within the month of December. In 2018, the Bracebridge Dinner will be held at 6pm on December 10, 12, 14, 16, 18, 20 & 22. You need to have an advanced reservation and ticket to attend the Bracebridge Dinner. In the past, you could only attend the dinner if you were selected through a lottery system and tickets were extremely limited. Reservations are now taken on a first-come, first serve basis and the dinner is now held several times in December to accommodate more guests. While you may be able to get last-minute tickets to the Bracebridge Dinner, it is recommended that you make reservations at least a few months in advance to ensure you get tickets for your desired date. Tickets typically go on sale 8 or 9 months prior to each year’s performance. You can make phone reservations by calling +1 (888) 413-8869 or book online by visiting the Travel Yosemite Booking website. The cost of the Bracebridge Dinner is dependent on a few different factors. Attending the Bracebridge Dinner is an expensive treat for most guests although this is a yearly tradition for some guests. Most people purchase a “Bracebridge Package” and rates vary by choice of lodging, type of room, and number of nights. 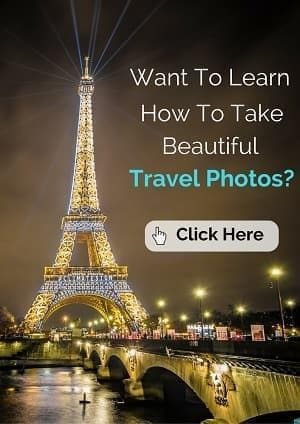 The Bracebridge Package includes you choice of lodging at Yosemite National Park (The Majestic Yosemite Hotel or Yosemite Valley Lodge), two tickets to the dinner, shuttle service to the dinner, and a professional portrait sitting. Prices in 2018 for 2 people for the Bracebridge Package with 2 nights lodging range from $590 to $1,000. To save money you can buy the dinner–only tickets ($320 per person in 2018) and then try booking a room elsewhere (such as outside Yosemite Park) or hope for discounted hotel rates in the park closer to your visit (there were vacancies at The Majestic Yosemite Hotel during our stay). However, to be safe, you should probably book lodging at least a few weeks before your visit. You can see packages and dinner-only tickets here. Where to stay for the Bracebridge Dinner? 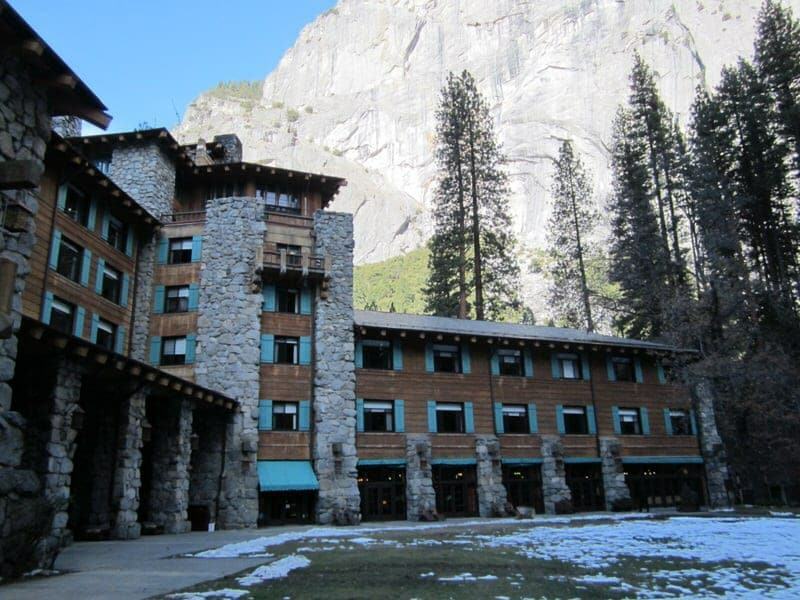 Most people stay in either The Majestic Yosemite Hotel (where the event is held) or at the Yosemite Valley Lodge. Most stay as part of the Bracebridge Dinner package although you can also book the lodging and dinner separately if you wish. Many of the other lodging options in Yosemite are closed or have limited hours in December, but the Big Trees Lodge in Wawona is usually open. This is actually where we stayed when we attended the Bracebridge Dinner; however, the year we attended there was a a free shuttle offered to Bracebridge Dinner guests. This is NOT the case in 2018 so you will need to drive (or arrange a paid transfer) if you decide to stay here. It is a 45 to 60 minute drive from the The Majestic. You can also find lodging outside of Yosemite Park, you can check out a full list here. I’d particularly recommend the Yosemite West and El Portal areas, as these are closest to The Majestic Yosemite Hotel. These are going to be 45 minutes to 1.5 hours from The Majestic. For example, the Yosemite View Lodge is a 60 minute drive from The Majestic. If you’d rather be around the south entrance near Wawona and Fish Camp, some places to check out are Tenaya Lodge, Big Creek Inn B&B, and Tin Lizzie Inn. Campers and RVers should check out the park’s list of campgrounds to see which are open year-round. Getting to the Bracebridge Dinner? If you are staying elsewhere in Yosemite or outside the park, you’ll need to drive yourself. Free self parking and valet parking are available in front of The Majestic Yosemite Hotel. 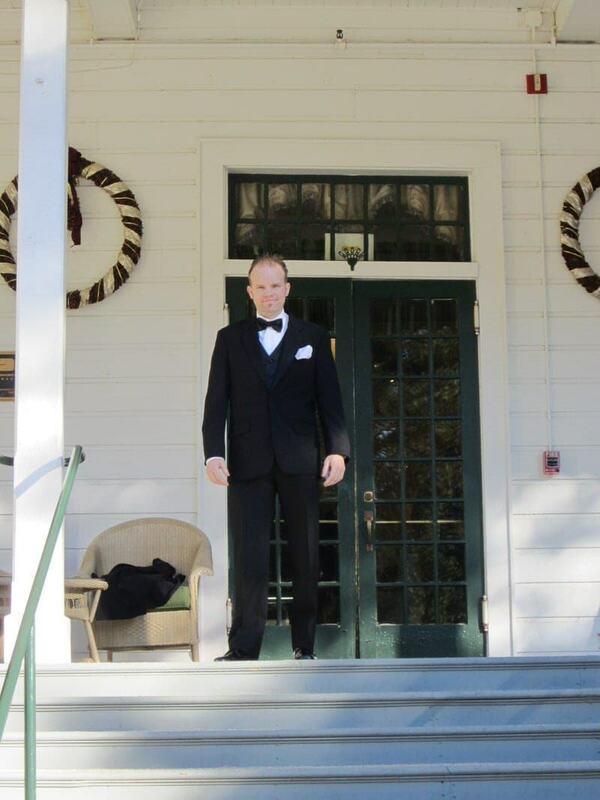 How to Dress for the Bracebridge Dinner at Yosemite? Formal dress is requested. This generally means a tuxedo or dark suit for men and an evening gown or comparable for women. Now based on our visit, approximately 1/3 of men wore a tuxedo, 1/2 wore a dark suit, and about 1/6 of men were wearing a sports jacket and dress pants. For women, most were wearing nice dresses although many would not necessarily be considered an evening gown. A number of women were also in tailored suits and nice blouse and skirt combinations. So to be comfortable, you’ll definitely want to dress up, but if you don’t happen to have a tuxedo or evening gown, your nicest party attire will likely be acceptable. Note that the mean age of the diners here is fairly high so dress tends to be fairly conservative. Also while the performers will all be in costumes, guests are asked to refrain from wearing costumes to the dinner. Other Tips for Attending the Bracebridge Dinner? Be sure to pick up your tickets at one of the many Registration times at The Majestic Yosemite Hotel prior to your scheduled dinner. If you would like to pre-order wine (strongly recommended if you wish to have wine with your dinner) or have special menu requests, you can do this when you pick up your tickets prior to the dinner. It is strongly recommended that children under 10 years of age do not attend. Given that most children (and perhaps many adults!) can not sit quietly for 4 hours, this makes good sense. There was one couple with a baby at a nearby table and the man was carrying the baby around most of the evening to keep the baby from crying and this was distracting at times. 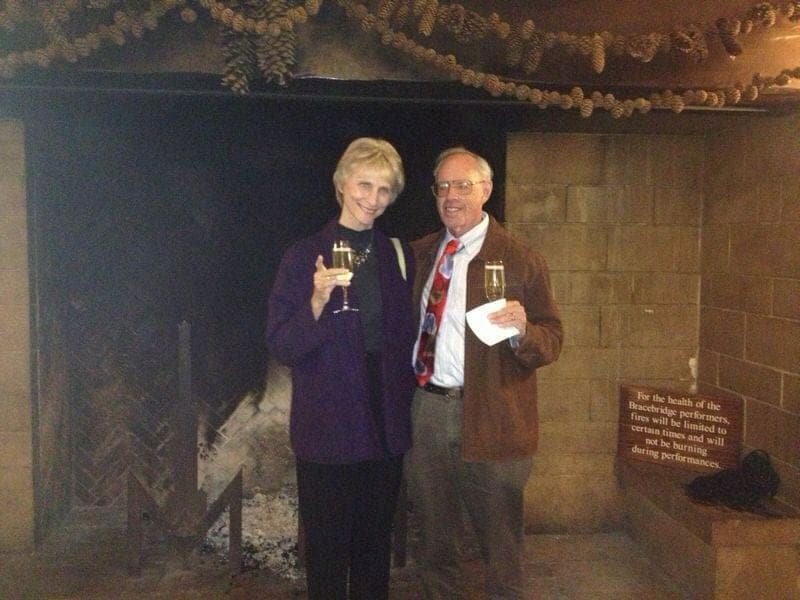 Check the Yosemite and The Majestic Yosemite Hotel calendars for other holiday events. If you are interested in learning more about The Majestic Yosemite Hotel we strongly recommend the 1-hour ranger-led Historic Hotel Tour (call ahead, reservations needed). If you want to learn more about the Bracebridge Dinner, there are 30-minute History of Bracebridge Dinner talks (December only, no reservations needed). Also if you can, you should make time for the free evening concerts at The Majestic Yosemite Hotel in which Bracebridge Dinner cast members sing and perform. Try to arrive a couple of hours prior to the Bracebridge Dinner to register, get your photograph taken (the line can be up to an hour long and the earlier you come the shorter the line), and enjoy champagne and caroling in the Great Lounge. 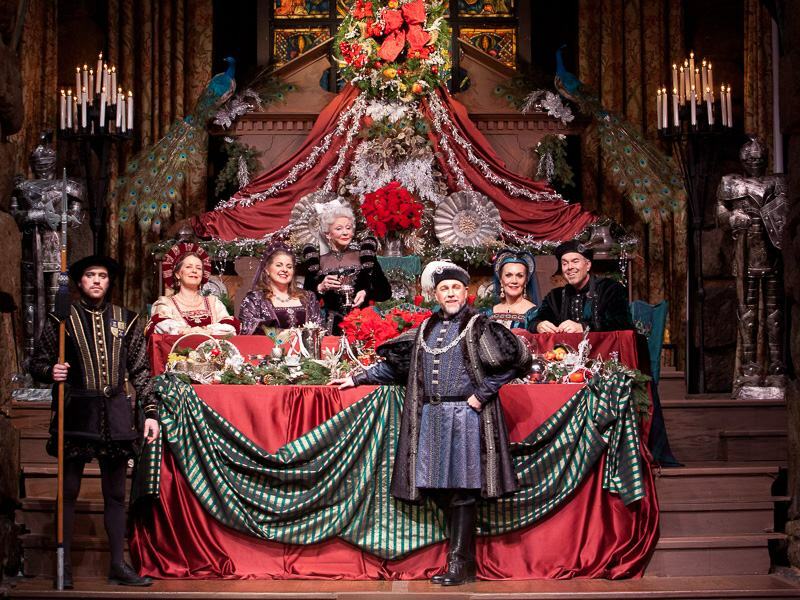 Seating at each table is decided on a first-come, first-serve basis so try to get in line as soon as the dinner line forms (typically 15 to 30 minutes prior to the performance) to ensure a good view of the center aisle and Squire Bracebridge’s banquet table. Electronic devices and cameras are not allowed to be used during the performance. So unfortunately this means you can’t take photos, but it prevents a lot of potentially annoying distractions during the performance. If you have devices on you, make sure they are turned off and stowed away in your purse or pockets during the performance. You are welcome to take photos prior to entering the Dining Hall and after the performance. What else can I do at Yosemite National Park in December? Some of the activities and lodging will be closed in December, but there is still plenty to do and see in winter at Yosemite. You can also check out our other Yosemite articles on planning a day in Yosemite Valley, exploring the Southern part of Yosemite, and our Yosemite photography guide. For more general information about visiting Yosemite National Park, check out the informative official park website managed by the National Park Service. Also check out Aramark’s (official contractor for Yosemite) website here which provides details about lodging options and offered tours. How do I find out more information about the Bracebridge Dinner at Yosemite? For information about the Bracebridge Dinner, you can check out the Bracebridge Dinner official website or the events website page on the Yosemite National Park website. You can also call (801) 559-4884 (reservations and information), The Majestic Yosemite Hotel Concierge Desk at (209) 372-1426 or the toll-free Yosemite reservations line +1 (888) 413-8869. Here is a narrative of our own personal experiences attending the Bracebridge Dinner at Yosemite. The schedule and events do change a little each year, but this should give you a good idea of what to expect if you choose to attend the dinner yourself. In addition to the Bracebridge Dinners, members of the cast also perform in shorter musical and theatrical performances at The Majestic Yosemite Hotel in between Bracebridge dinners. All guests of The Majestic Yosemite Hotel, as well as those attending the Bracebridge Dinner, are invited to these public evening performances and no tickets are needed. You should just show up a bit early to get a good seat in the lounge with performances lasting about 2 hours. We attended a concert of musical theatre selections and it was very nice. Even our untrained ears could tell that many of the performers were professionally trained. We felt like this was a good warm-up for the Bracebridge Dinner the following evening. After spending the morning and afternoon exploring the ancient giant sequoia trees of Mariposa Grove and learning about the history of the settlers in the park at Yosemite Pioneer History Center, we headed back to our room at the Big Trees Lodge (then the Wawona Hotel) to get ready. We had booked the Bracebridge Package and chose the Big Trees Lodge as it is the most historic hotel at Yosemite National Park and it seemed like a good mid-level choice between the more expensive The Majestic Yosemite Hotel and more rustic Yosemite Valley Lodge. However, it should be pointed out that the Wawona is a good 45 to 60 minutes from the attractions in the Yosemite Valley so be prepared to drive back and forth as there are not regular shuttles in the winter. The setting does offer the chance to experience a very peaceful area of the park and for that we were very content. Note that in 2018, the Big Trees Lodge is not included as part of the Bracebridge Dinner packages; however you can book it on your own but you will have to drive yourself to the dinner and events. 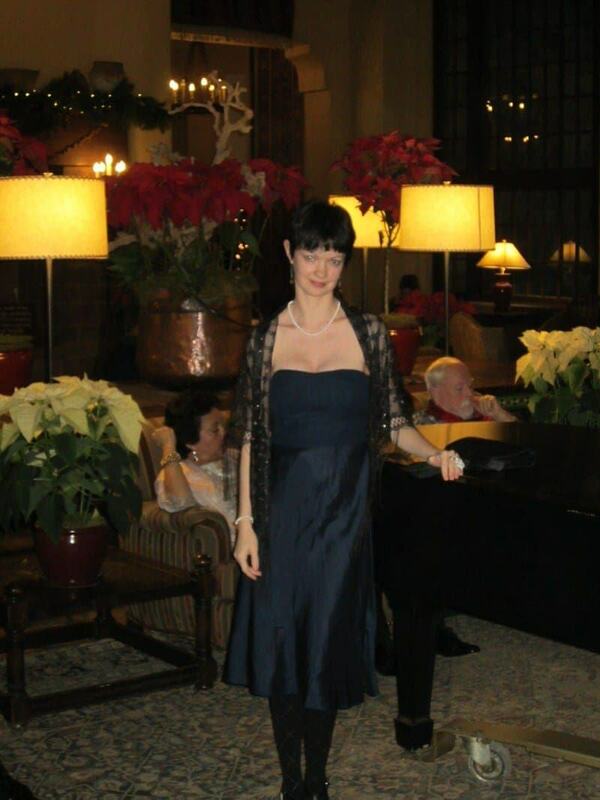 I wore a silk dress I had owned for many years, formal but not really an evening gown. I had actually rented a floor-length evening gown from Rent the Runway that was supposed to have been delivered the day before; however, due to some complications regarding the UPS address of the hotel and the fact that UPS does not deliver to the hotel on weekends, I did not get the beautiful Nicole Miller dresses I had ordered. However, I got a full refund from Rent the Runway and my back-up choice ended up working out well. Ethan rented a tuxedo for the weekend. It was fun getting all dressed up. After we finished getting ready, a free scheduled shuttle came to pick us up at 3:00pm to take us to the Bracebridge Dinner. We arrived at The Majestic Yosemite Hotel a little after 4:00pm, checked our coats, and got in line for the portrait sitting. 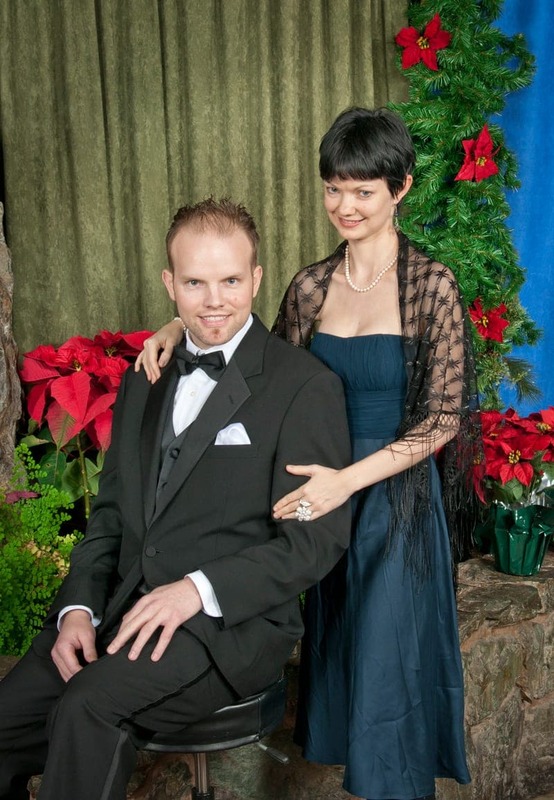 Each year, guests of the Bracebridge Dinner have the option of sitting for Christmas photographs, and a few photo prints are included in the price of the Bracebridge package. The only downside is that it took several weeks to actually receive the photos in the mail—but we really loved the photos taken by Nancy Robbins. They made excellent belated Christmas photos for family and friends. Then we went into the Great Lounge—which is a large public area of The Majestic Yosemite Hotel—which had a cash bar set up and two men were playing pianos. Around 5:00pm, they started playing Christmas carols and a booklet of the lyrics was circulated and guests were invited to sing along. We sat next to one of the giant fireplaces for about 45 minutes singing until people started to line up to go into the dining hall for the Bracebridge Dinner. We handed over our dinner tickets and were then ushered to our table. Each of the 30 or so round table-clothed tables (for some reason we had expected long banquet style medieval tables alongside each side) seated 8 to 10 guests. Our table had 9 guests as we had three parties of two and one party of three. We were at table 14 which happened to be about three rows of tables from the front where the Bracebridge banquet table sits. However, we were alongside the wall instead of next to the center aisle and we would later learn that the best seats are either at the front or along the aisles as action goes on both in the front, along the aisles, and sometime at the very back. However, the music and voices carry quite well and we still got to see much of the action. TIP: While you can’t choose your table once you get into the dining hall, you do get to choose your seat and those who get into the dining hall first get to face the stage or aisle. So if you want to avoid having to crane your neck, get in line as soon as it begins to form. Our first dish was the “Relish” dish of baba ghanoush, olives, and flatbread and was quite good. The food overall was good and none of our dishes were bad, but a few were only OK. We both really enjoyed the Relish dish, Fish dish, Soup dish, and Beef dish. However, the salad, peacock (duck in this case), and pudding were just OK in my opinion. Ethan enjoyed some of these a bit more than me. Portions are fairly small but with seven courses you’ll likely leave full. We heard mixed reports of those who ordered the Vegetarian dishes (Vegan, Gluten-Free, and Vegetarian menus are available) with one person reporting they were good and one person finding some of these dishes to be quite bland and dry. Overall, we thought the food was pretty good although not quite as good as were expecting given how good the culinary staff is at The Majestic Yosemite Hotel. However, given that the food was cooked and served to over 300 people at one time, it was quite amazing! Just don’t expect Michelin star quality dishes. The food and beverage staff were great and the only real complaint was that towards the end of the meal several members of our table had to request tea or coffee a few times before it was finally provided. Seating for the performance began at 6:00pm, but the actual performance begins after everyone is seated at 6:30pm. It begins with some chimes and then the hall becomes silent. Then voices, then singing, and finally a procession of performers. The performance begins! The 3 ½ hour visual feast includes all kinds of music, rituals, humor, and shenanigans (usually instigated by The Lord of Misrule [a.k.a. the jester]). Part old-fashioned Christmas celebration, part irrelevant good-natured antics, it was an enjoyable performance. Many of the performers are professionals who work in the San Francisco Bay area, including members of the San Francisco Opera. 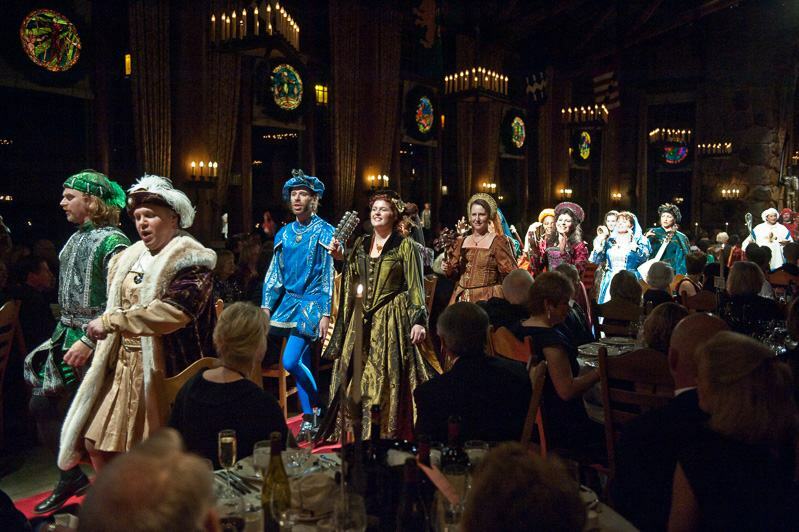 The performance is punctuated by each course and while the actors continue to sit at Squire Bracebridge’s banquet table up front in character, the performance pauses as food is delivered. While much of the performance is scripted and remains the same across all the evening performances, some audience participation and improvisation does occur. Towards the end of the evening there is a toast of wassail (hot mulled cider) in the dining hall and then the evening slowly begins to fade to an end. Even though we had been sitting for almost 4 hours, I was a bit sad when all the performers processed out of the hall and the lights came back on. However, I will note that a few people near us were clearly tired or restless a couple of hours into the dinner, so I think people should carefully consider if they are actually interested in a 4-hour Renaissance-themed Christmas dinner pageant before investing so much money. It is clearly not for everyone. I took a couple quick photographs on the way out after the performance (none are allowed during the performance). Many of the performers were standing outside the dining hall as you exit. You have the opportunity to briefly talk to them and shake their hands. We collected our coats and then hurried out into the cold winter night to meet our shuttle. We excitedly compared notes on our shuttle ride with the other couple staying at The Majestic Yosemite Hotel. We were happy but very tired when we arrived back at the hotel. Was it worth it? It was an expensive evening to be sure and likely a once in a lifetime experience for us. This was our Christmas celebration for the year in the place of exchanging any gifts, and we both felt like being part of this historic and festive dinner pageant was well worth it. It felt like an old-fashioned Christmas and we really really enjoyed our weekend at Yosemite National Park in December. So, that is our guide to attending the Bracebridge Dinner at Yosemite National Park. 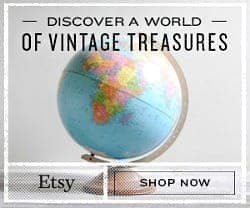 We hope you have found this article helpful! 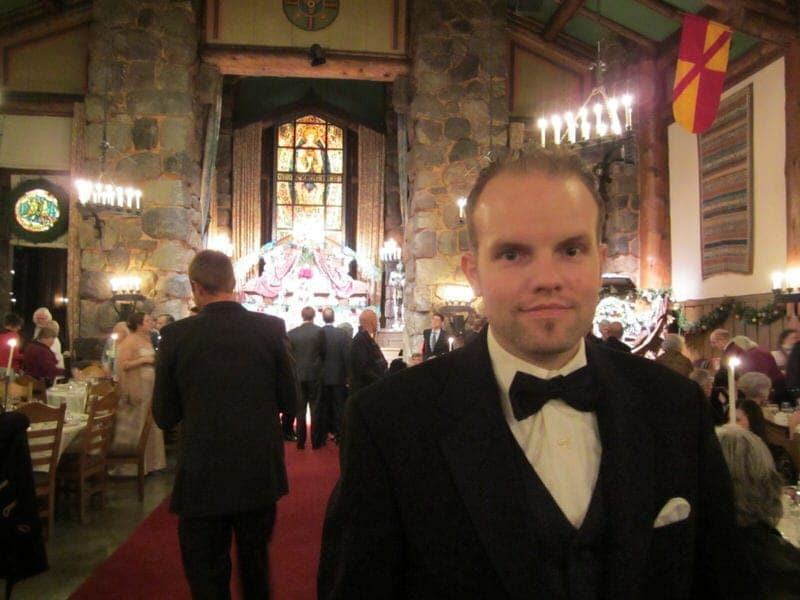 Have you been to the Bracebridge Dinner at Yosemite? If you’ve been, we’d love to hear your own personal experiences. Want to attend? As always, we’d love to hear your thoughts, and are happy to answer any questions you may have about attending the Bracebridge Dinner or visiting Yosemite National Park. 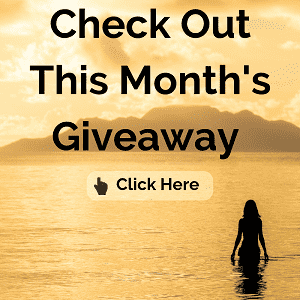 We love hearing from you and you can ask any questions in the Comments section below. I never knew there were such a secret, exclusive dinner party. Fascinating article! Thanks for writing. We attended the same year you did. We were disappointed. Our $12 per glass wine is sold at Trader Joe’s for $6.00. The fish dish smelled like fish. The beef was tough. The rest was just mediocre. I thought it was pretentious and phony. Would never go again. I’ve seen better performances at our community theater. For this price I expect excellence..
Hi Gail, thanks for sharing your thoughts! 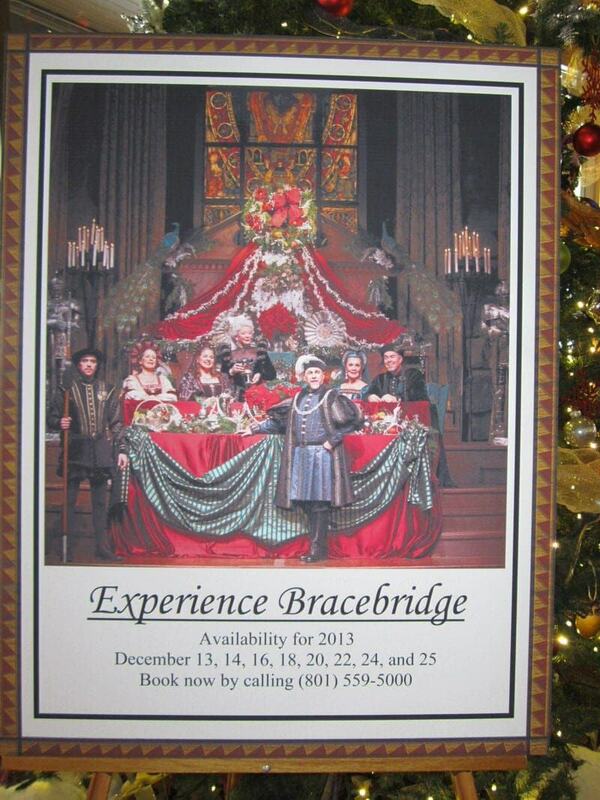 Sorry that you were disappointed by your Bracebridge experience. We were not as impressed by the food as we had thought we would be (we didn’t try the wine), but did not find it as bad as you. I think with the large number of diners, there is probably some inconsistency as well although it was impressive how quickly they got so much food out to so many people at one time. Glad you enjoyed the post Connie and hope that you get to attend the Bracebridge Dinner at Yosemite some day! It is a great holiday event. Thank you for posting your experience of the Bracebridge Dinner, so detailed! Your account will help us in planning our visit next month. Hi Janet, I am glad your found our Bracebridge Dinner article helpful. 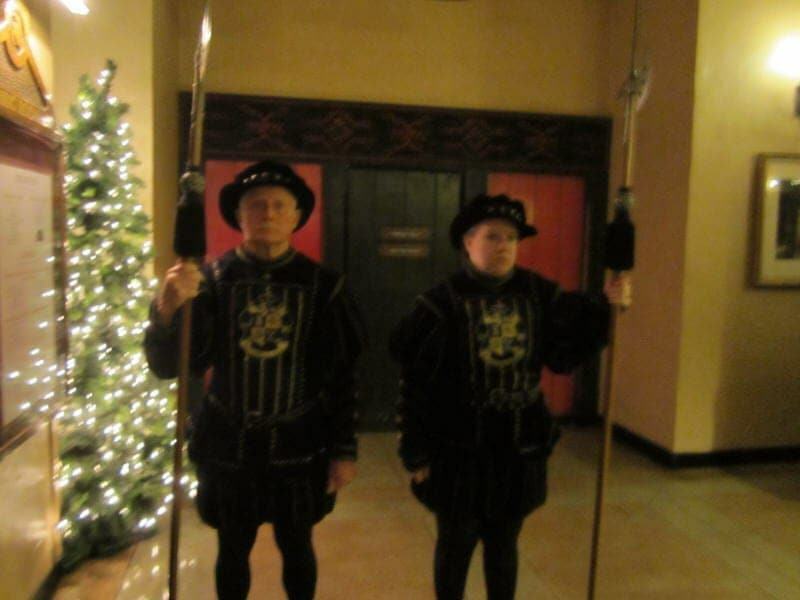 Attending the dinner The Ahwahnee is a fun experience and it is great to be part of such a long-running American Christmas tradition. 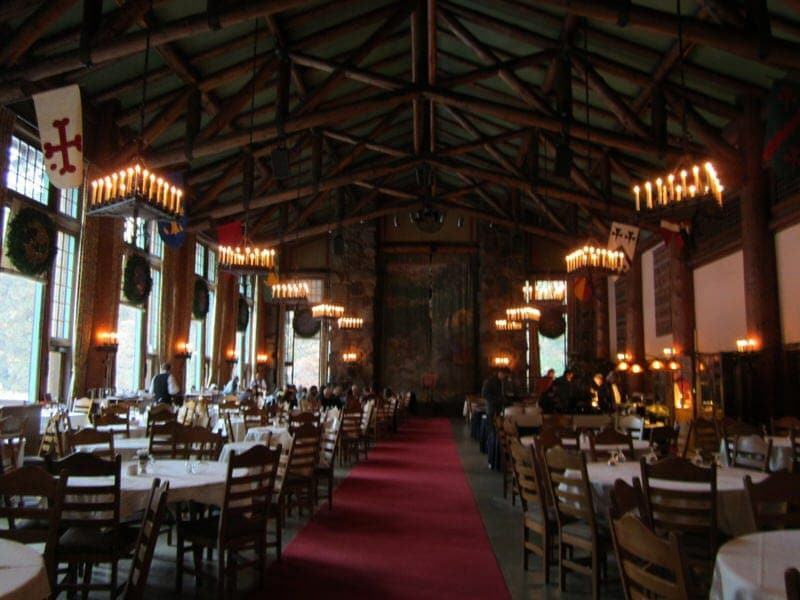 I would recommend attending at least one of the free carol or theater performances on a night before or after your dinner date at The Ahwahnee. These more informal performances are a lot of fun. Enjoy the dinner and feel free to come back and let us know about your Bracebridge experience. 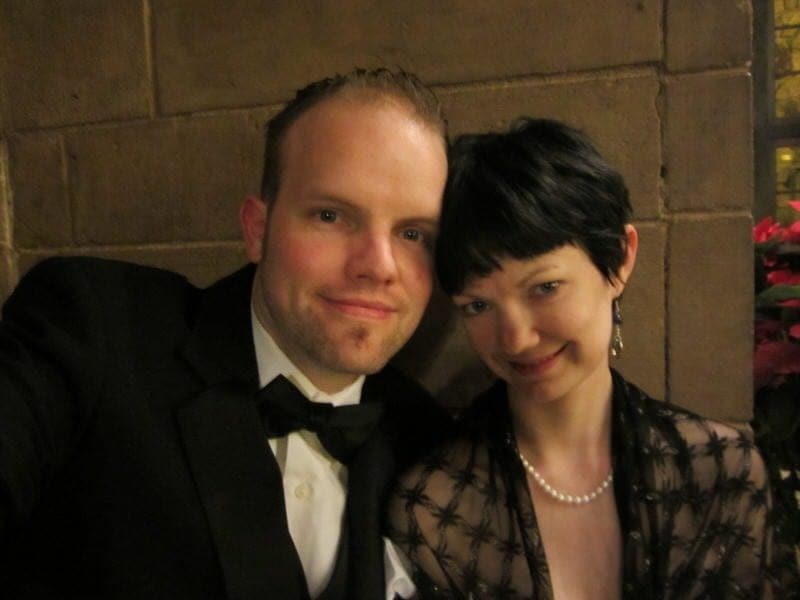 We attended the Bracebridge dinner on the same night as Jessica and Ethan. Humor, merriment, scandal, wickedness and vigorous song prevail, helping the four hours to fly along smoothly. When the cook proposes a shocking departure from Bracebridge tradition–savory PORK instead of BEEF for the main course–near chaos erupts as the matter is debated with verbiage, song and dance. The chef’s position is clear: The word PORK is prominently displayed across his apron. But in the end the authority of the formidable Bracebridge mistress prevails and the disgruntled cook humbly exits to prepare the traditional beef amid much consternation. Later, the important question of brandy vs. rum on the plum pudding is debated in song and verse, this time yielding a compromise that satisfies one and all. Our seat at Table #1 was a telescopic distance from the stage but had an unexpected benefit. 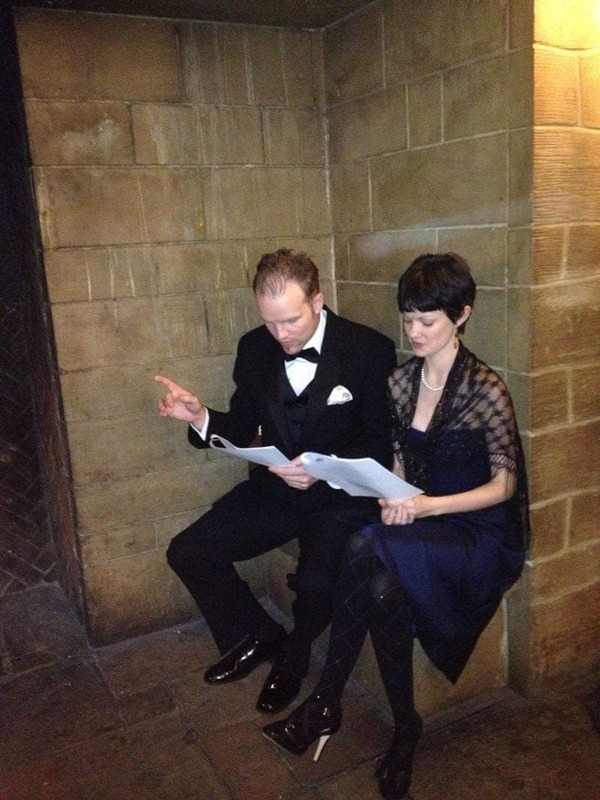 Its location, just a few feet away from the hall entrance, was near the actors as they assembled and sang. One could experience, at very close range, these intensely dedicated performers. Tables anywhere on the aisle are desirable, as their occupants may be unexpectedly drawn into the production. We often order a vegetarian selection. At Bracebridge we asked the server for one vegetarian main course, but not for vegetarian appetizers or desserts. Simply put, it was a third rate–looked awful, tasted worse. Attempts to mimic a meat dish are nearly always dismal failures and this offering was no exception. Maybe don’t attend Bracebridge expecting French Laundry elegance in cuisine. The food was ok, but just that. Of course the Bracebridge dinner celebrates a British Christmas, not a French one. The more memorable dishes were the Baba Ghanoush first course, the Borscht and the crab-grapefruit concoction. The wassail was all right, but one can do much better at home. The beef was cooked appropriately rare and many of our table companions thought it was tasty. While not recommended, our trip was a spur of the moment decision: Barbara (my wife) consulted the website on Friday afternoon hoping to get on a list for 2014. 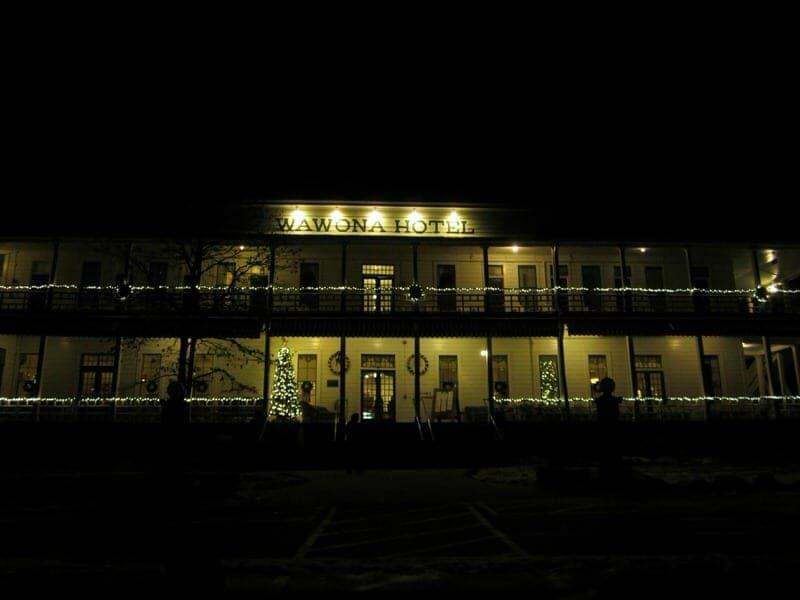 The next morning found us zooming toward Yosemite’s Wawona Hotel for the Sunday dinner. Perhaps the greatest pleasure of all was meeting up with Jess and Ethan while hiking in the Mariposa Sequoia Grove. The late planning explains our less formal attire in the picture above. On Saturday rather than attend the Bracebridge concert we joined an impromptu birthday party at the Wawona Hotel lounge for the 30-years-in-residence pianist/singer/improv artist Tom Bopp. Among his many offerings was a rendition of the Tom Lehrer ballad “Poisoning Pigeons in the Park”. In fact Bopp’s style is reminiscent of Tom Lehrer himself. But Tom Bopp wisely declined to perform Lehrer’s classic “Chemical Elements” ballad. Thanks Bill & Barbara for sharing your thoughts. Although we attended the same performance, we were seated in different locations with different views of the show, had different servers, and even had some different dishes and it is great to have a second perspective. Also, thanks for sharing your thoughts on Tom Bopps’ performances at the Wawona, we missed these but they sound great. 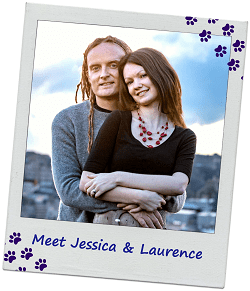 We are so happy to have meet you both as well! Thank you, Bill and Barbara. Even without your comment it already smelled like a ridiculously overpriced tourist trap so we will spare ourselves the indignity to attend. 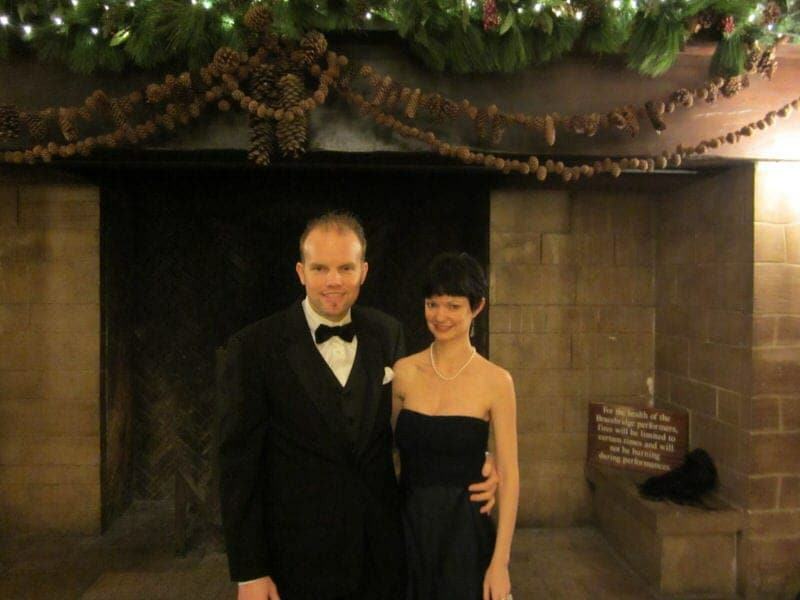 we were there for a wedding earlier this year and the Ahwahnee is a beautiful hotel. I love this tradition and hope to be able to do it one day! Yes, it is such a lovely tradition. I hope you are able to go some day! We had a wonderful visit to the Awahnee several years back. I had never heard of this special Christmas event but it looks like a truly unique and special time. I would consider it for a year when we didn’t have the family coming. Thanks for sharing! Yes, and you can even attend a week or two before Christmas so you can still celebrate Christmas at home. We went the weekend prior to Christmas on Dec. 20th. Looks like a fun time was had! Great menu and venue also. I adore your shawl, very pretty. Happy New Year! Yes, it was a wonderful holiday together! Happy New Year and glad you are back to blogging!